If you grew up in the '90s and spent any time in your local arcade, you might remember these. 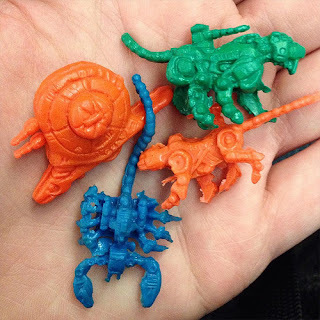 They're tiny bootlegs of Japanese Zoids keshi that you could commonly find available behind prize counters in exchange for a few game tickets back in the day. For anyone not up on their Zoids history, it's a franchise that began in the early 1980s featuring giant robots with various animal and dinosaur designs. Over the years it has spawned anime series, manga, video games and toys. 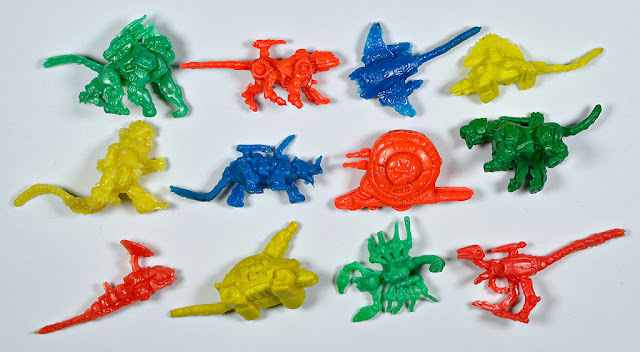 I remember trading a classmate something for a little green sabertooth Zoid on the playground in grade school and thinking it was totally awesome, despite the fact that it was missing a leg and that I had no idea what Zoids were, or that this little rubbery thing was supposed to be one. I also remember getting a couple more of these bootlegs back then, either at the arcade or from capsule machines (they might have been sold that way too). It would take a couple decades for me to finally find out the origins of these rubbery robo-animals and add a bunch more to my collection. From a technical standpoint, these are not great toys. They are really cheaply-made, with lots of flashing and molding imperfections. But I'll be damned if they're not charming and lots of fun. I mean, look at that little gorilla Zoid. And that snail. And those dino-bots. So cool. Plus, if you're like me you get instant feelings of nostalgia just looking at them. I'm guessing these bootlegs came in 12 sculpts, as shown above, although the original Japanese keshi probably had more. I'm not positive about either, though. Has anyone come across any others? Some nice finds you have here. Holy crap, I used to play with these all the time as a kid. I have been scouring the internet forever trying to find some and make sure I wasn't crazy! Thanks for the comment...I am glad it was helpful! The sculpt look the same, but the colors and eyes are different. Very cool...thanks for sharing that pic!